Your tax deductible donation and your engagement can bring economics back to the real world and the real world back to economics. IDEAeconomics is a 501(c)(3) eligible organization. Take action by making a one-time tax deductible donation to IDEA. You can also provide an extra level of support by donating monthly to IDEA. Every amount counts and is appreciated. 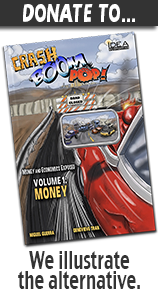 And now for something completely different... Help us to create CRASH, BOOM, POP!, a graphic novel series that aims to lay a good foundation in economics. Students and adults alike will enjoy an intensive, yet easy-to-read series that takes on the most complex neoclassical concepts, with tongue firmly planted in cheek. We want to expose how money and economics actually work, without all of the complicated rhetoric. In October 2014, we launched a successful campaign and raised over $35,000! We're now hard at work completing volume one for October 2015. For all of the details including a FREE Sample, press coverage, Kickstarter video, and bios on the author and artists, click here.